Natives of Eastern Nigeria who live outside their region are always keen about the Christmas season as it is the one time they travel back home to observe several ceremonies and reconnect with their extended families. 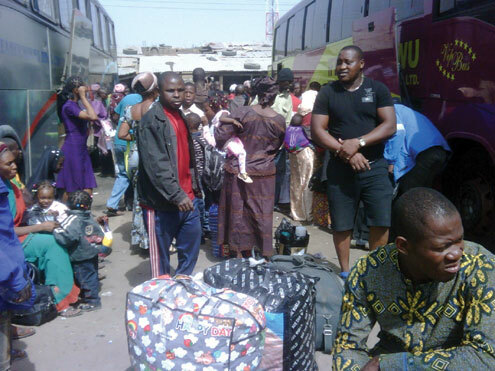 They almost always embark on their journey home by road via luxurious buses and shuttles, and due to increase in the number of vehicles heading east, travellers almost always have to deal with traffic jams and gridlocks. Usually, travelers heading in the south-east direction from the Asaba end get the first taste of the traffic at the Onitsha head bridge before the main course within town where commercial activities add to make the traffic even more frustrating. Seeing as Christmas is here again, and almost every Igbo indigene has plans to visit home, there is bound to be serious traffic gridlock. But not to worry, Jumia Travel, Africa’s No.1 online hotel booking site has a few tips and ideas to help alleviate the stress. The early bird gets the fattest worms. If you are determined to beat the Onitsha traffic or at least cut out a lot of it during your journey. You should make plans to wake up super early so as to leave in time. If you are travelling from Lagos and commuting via public transport companies such as God is Good Motors or Chisco, endeavor to catch up with the first bus which leaves at about 6am. However, if you are setting out on your own, you can actually set out as early as 5am, depending on where you are setting out from. You however need to be vigilant so as not to fall victim to robbery or mugging. Hunger has a way of intensifying stress and making you angry even in situations where you would be angry on a normal day. Keeping your stomach filled helps you stay focused on the traffic ahead, keeps you alert, and less stressed; and makes the traffic much more bearable. Luckily there are hawkers who parade the aisles of the traffic with tasty delights, you can patronize them or you can pack your own food before you set out for the journey. For those who have tiny stomachs and cannot afford to indulge in food, popcorn is a life saver. Eating one kernel at a time occupies your mind while the carbs calm you down. Music is food for the soul and everyone has their kind of music, the one that calms and soothes their nerves in times of stress of difficulties. Before you set out on your journey, ensure you stock up on CDs and MP3s. Make sure you diversify the genre as there is no telling what mood you will be in when the gridlock sets in. You might find out that singing along to loud banging music might work better for the stress than slow music. Singing does not only get your mind off the traffic, it also changes your breathing pattern, which in turn lowers stress levels by slowing the heart rate and calming the nervous system. If you are however not a fan of any kind of music, you can simple go for an audio book or a podcast. Most people prefer to travel in their own private cars, however, it may not be the best option to deal with Onitsha traffic, especially if you intend to get to your destination as soon as feasible. The public transport systems have options that offer maximum comfort similar to that which you get from your own car. Sitting in the car and having someone else struggle through the traffic give you the opportunity to leverage your time focusing on tasks that provide utility or pleasure to your life as a whole. Again, these public transport drivers are aware of certain short cuts and routes (unknown to regular commuters) that help them escape some areas of traffic. Saying that the Onitsha traffic is exasperating and infuriating is an understatement. However, if you try to force your way through traffic and carry an aggressive style you will end up stressing yourself even more. When you find yourself at the point of frustration and anger, rather than banging on the wheel, making faces, muttering hateful curses under your breath, try to take a deep breath, as deep inhalation has a way of lowering stress levels, making it easier to deal with the gridlock.